Mary Dennis invites you to view her Portfolio, featuring pictures of a project and explaining some ways Feng Shui Design influences the feel and energy of the space. “I don’t know what to do with my living space”, was the cry I heard on the other end of the phone. What to do with a large, awkward shaped room? This project had an unusual floor plan. As you entered through the mouth of chi, lifes journey/career, indicated by pictures 1 &2. the room opened up into one big rectangular space, with an extension in the upper right hand corner. The room had no walls to sepearte foyer, living room, den and music area. The chi had no place to settle, and felt very scattered and quick moving. I loved the challenge, and the following pictures are my feng shui design results. The client intention was to design a harmonious living space for herself and her husband to enjoy, music, relaxation and prosperity. My design intent, was to create balance and integrate the space so a feeling of wholeness became evident. The open environment layout would be planned to include a foyer, sitting area, music area and overall connectivity. Correct Placement for manipulating the chi was very high on my agenda. It was also important to create pathways and focal points in each space.. An overlay of the bagua was used for determining the more prominent areas of placement. Setting invitation in the foyer area became my first step. I anchored and encouraged the chi to feel grounded by adding a small rectangular area rug, and floor plant. The placement of the trunk worked to create a compassion area, as in something to lean on for support. Sconces and plant lighting were added to lift the spirit and welcome prosperous, harmonious chi, my clients intentions were made clear. The main entrance, which sat in Life’s Journey, was activated by adding a water element. The intentional placement of the dolphin statue supported prosperity and success. Visual balance in all environments supports good decision making and healthy design intelligence. When there is an architectural detail in a room, such as the pass through opening to the kitchen, as seen in picture #3, hang your predominant art work at the same eye level and height. When placing predominant art work at the same height, visual balance becomes present and a feeling of congruence occurs. An architectural indentation between the foyer and kitchen created a missing corner. Missing or empty corners subliminally feel unfinished or lacking. I added a favorite screen to fill in the absent space and included a copper metal disc to better balance the elements. Completeness and wholeness promoted well- being. A distinctive church bench was placed along the outside kitchen wall to direct chi, and to define a pathway into the bedrooms. I calculated a Universal Design guideline of 3 ½ feet for a comfortable path. The sofa placement had a multiple purpose; one, to help define the pathway behind it, and the other, to lay the foundational anchor for a new seating area. 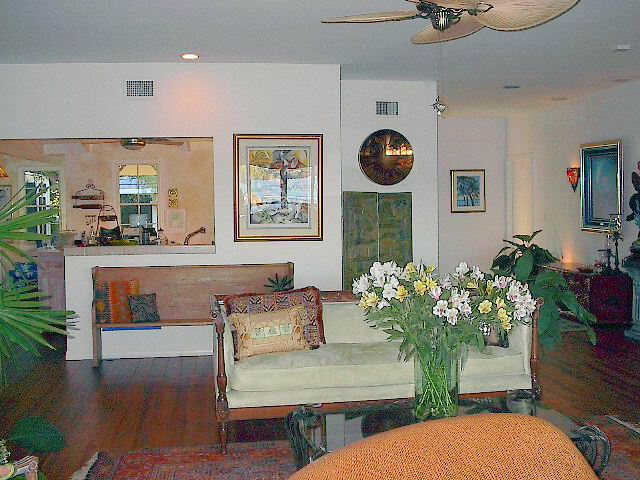 The exact placement of the arm of the sofa, as seen in picture #3, also supported the same vertical, visual line as the open pass through to the kitchen. This placement, also anchored the indented partition, and visually connected the foyer wall. One can see how this position visually connected all three primary wall lines. The results added an improved sense of balance to the overall space. In addition, the off white sofa was used as a foundational piece to establish a designated music area. A beautiful, white, baby grand piano became the portable focal point. The smooth, wavy, hood lines of the baby grand piano added a lovely yin yang rhythm and equilibrium to the atmosphere. Incorporating a glass top cocktail table and French provincial chairs, confirmed the elemental balance, and created a sense of community. As seen in picture #4, a reading and TV space was also assimilated into this all-embracing environment. A 4ft. pathway was incorporated between the music vignette and the TV room. Two large, earthy, brown, leather chairs were used as introductory anchors for this glass enclosed area. The angle of the chairs softened the invitation into the TV area. The angling of the chairs, created a comfortable, pathway of invitation directly to the television and library-station. A feeling of trust and comfort was created. In conclusion, one of the preferred requirements, for redesigning a space, is to use your clients existing furnishings and accessories. With this project no new items were purchased nor were any items discarded. Family area rugs were used in each vignette to define the seating areas, as well as to, secure each independent setting. All existing furniture and accessories took on new positions and importance. 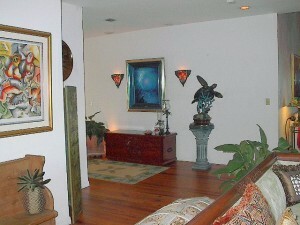 It is my experience; that in most instances, your clients already own objects that can be used as feng shui cures. You need only to identify them, clear them, and restate their new, symbolic intentions. Family ‘altars’ can be placed anywhere in the home. 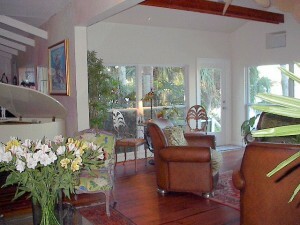 Creating a space that is inviting and comfortable invites us to stop, relax, and meditate. 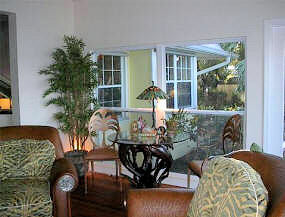 As seen in picture #5, flanked by two chairs, and bordered by an outside garden, a table was placed in the reading –TV room. Family pictures, a candle, and a live plant designed a family dais. Adding a tree into this setting immediately summoned the outside vegetation into the space. Research has proven that our connection to the outdoors nurtures our well-being and our spirit!